Irrational Games is showing off BioShock Infinite at E3, a place where its fans won't be... or will they? Irrational Games recently held a contest that resulted in a fan becoming the new owner of BioShock Infinite's automated stallion company. The studio's next initiative is a little crueler, taunting fans with "The Great Irrational We're Going to E3 and You're Not" contest. Irrational first showed off BioShock Infinite with a 10-minute trailer in September 2010. The company reveals that the second official gameplay demo will be shown at E3 2011, and it's rubbing in the fact that you won't be there to see it. This taunting is all in good fun, because the whole point of the "We're Going to E3 and You're Not" contest is to actually send a fan to the industry-only show. 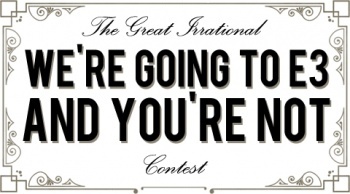 Anyone that enters their information here by May 18 at 5:59 EST will have a chance to get into E3 on Irrational's dime. One lucky winner and his/her friend will be flown to Los Angeles and set up for an overnight hotel stay. They'll then be escorted to Irrational's E3 booth and forced to watch the new BioShock Infinite gameplay demo whether they want to or not. Once it's over, the winners will be set free to cause whatever damage they can muster on the rest of the show floor. It's a pretty sweet deal, and you don't even have to have a fancy name this time. If one of you Escapist fans wins, let us know and we'll try to make time to give you a high-five.